April 7 is our birfday. We nine years old. We are true sisfurs from same momma cat. We been living wif our hooman mum since we three months old. We luv our mum, furever home and all our anipals. Fank you to all our pals around da world for sending us such lovely Birfday wishes n yummy treats. 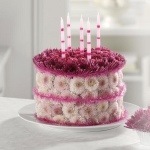 Today we combine our birfday celebration wif pre pawty to PBS Masterpiece show Selfridges. Pawty from 8 to 9pm EST. Use hash tag #Mooshiebday. 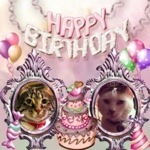 Special fank you to our Texas furiend @nancycakeface for sending us the beautiful Birfday cake. This entry was posted on Sunday, April 7th, 2013 at 12:00 pm and is filed under Feline Lifestyle, Uncategorized. You can follow any responses to this entry through the RSS 2.0 feed. You can leave a response, or trackback from your own site. Happy Birthday from the Tomcat home ladies! Hope it is full of joy and wonder.